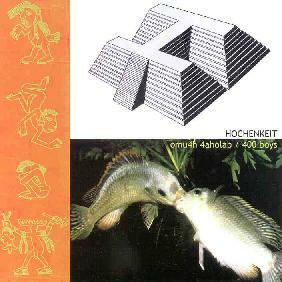 Hochenkeit - "omu4h 4aholab / 400 Boys"
When I reviewed Hochenkeit's first album (in AI #10), I had enjoyed the band's freeform Krautrock influenced instrumentals but had felt the album was a bit hit and miss. I also felt the band had quite a bit of potential and indeed on this sophomore effort Hochenkeit churns out some exciting Krautrock influenced psychedelia that leaves any retro accusations in the dust by infusing healthy doses of drone and other forms of experimental freakiness that set it apart from those of days gone by. There's very little info about band members but instrumentation includes violin, harmonium, guitar, cumbus, bass, Hammond, RMI, tapes, finger cymbals, sax, madal (a Tibetan drum), and chang (a Thai reed instrument). And in case you're wondering about this strange album title, "omu4h 4aholab" translates to 400 Boys (from what I'm not sure) and the title comes from "the mythological Aztec troublemakers who are the reputed source of debauchery and mayhem". Sure, sounds good to me. The album opens with "Seen", on which a pulsating drone lays the base for a trippy bang-on-a-can Middle Eastern sound. "Two Fish Kissing" has a floating Pink Floyd "Us & Them" sound, but more freeform, drifting, and psychedelic. There lots of shimmering liquid psych sounds and even a bluesy guitar mixed in the background, all against a steady drone. "To Be Born Drunk And Die Dreaming" is a raw Krautrock jam with repetitive funky patterns and freaky loops, and mixed in with it all is a tribal freakout that sounds very much like Sun Ra at his spaciest. And "Give Them To The Ants" is a funky spaced out jam with a hint of Dub rhythms and guitar licks that are simple but blistering. The tension builds steadily and the guitar gets increasingly acid drenched while the rhythm section maintains a jazzy beat. The whole thing culminates in a mind melting freakout of guitars, drums, and heart thumping bass lines. Rounding out the set are two 14-minute tracks. "400 Boys" is a volcanic mish-mash of drones, ear piercing tones, rumbling percussion, and various other wailing sounds. Actually the music develops very little across its 14-minute length, the whole track sounding like a massive intro to something larger. "Please Turn Out The Sun" is meandering collage of sampled voices, sparse but trippy guitar, scattered percussives, and bubbling electronics. The music develops very slowly, eventually getting quite loud. The song is freeform and psychedelic but has more of a sense of melody and "regular" rock structure than previous tracks... at least at certain points, because it ends in a total sonic droning cluster of raking strings, crashing cymbals, and sounds galore. You would think with this kind of music that Hochenkeit would be at their best when stretching out on extended tracks, but in fact it's the shorter tunes that are the strongest. And given the strength of the first four tracks on this discs I have to give it a hearty recommendation. Krautrock fans will enjoy this for having the freeform elements that they love but without the retro nostalgia. Think Yeti-era Amon Düül II with an updated sound. omu4h 4aholab / 400 Boys is distributed by Road Cone. You can visit their web site. Contact via snail mail at Road Cone; PO Box 8732; Portland OR 97207.